Academic financial quantitative analysis began in earnest in the 1970's as a response to the Efficient Market Hypothesis (EMH). EMH proponent believed that you can't beat the market with stock picking because everything about a stock is already known by the market. As a test of EMH, researchers began to scour the CRSP tapes of stock prices and found "anomalies". They found that you could beat the market with well diversified portfolios of small cap stocks, stocks with low P/B, low P/E and so on. Thus quantitative analysis was born. Today, we have gone well beyond the early days of anomalies literature. Now technical analysts have embraced quant techniques with gusto, Most of what technical quant research have been in the form of, "What did the market do when X happened?" Among many others, leaders of this form of analysis include Ryan Detrick, his former employer Schaeffers Research, and Rob Hanna at Quantifiable Edges. Yet, there are many pitfalls to quantitative technical analysis, as the fundamental quants have learned through many decades of painful experience. 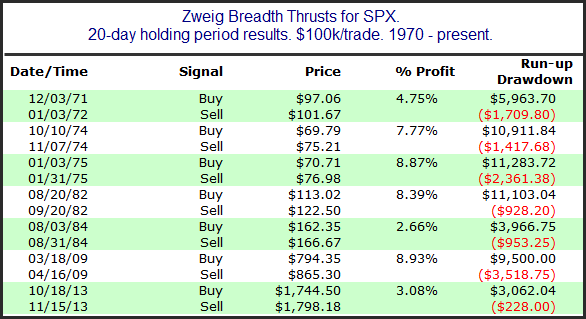 Consider the following example as a case study: Last Thursday, the market flashed a Zweig Breadth Thrust buy signal, which I wrote about (see Bingo! We have a buy signal!) and a number of other technical analysts comment on as well. I am one of the biggest believers in the world about the idea of stock market breadth being one of the best tools we have to indicate financial market liquidity. But based on this evidence, I cannot offer much in the way of optimistic commentary about this current ZBT signal, especially since it has occurred at a point that appears to be the early stage of a new downtrend. Robust rallies within downtrends are great opportunities to get ready for the next phase of the downtrend. The problem is that they often disguise themselves that way, when in reality a new uptrend is beginning after a long bear market. This current moment does not seem like the end of a long bear market just yet. What's going on? How can two different analysts looking at the same data come up with such vastly different conclusions? What's the theory behind the signal? What I will try to do in these pages is to take apart the ZBT signal and identify the differences of interpretation. First and foremost, what I learned as a quant is to make sure that there is an economic rationale behind a market factor or signal. Consider the following market signal uncovered by Bespoke, which has had an incredible success rate and has been performing quite well this year. But would you really put money on it? (Recall that American Pharoah won the Triple Crown this year). First lesson: There are spurious correlations everywhere. In the case of the ZBT, we are betting on breadth and momentum. There is a set of well established academic literature that momentum works, both fundamentally (estimate revision, earnings surprise) and price momentum. There are a number of nuances to positive breadth and, more importantly, price momentum. 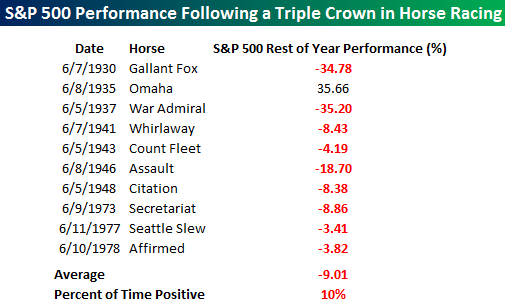 Sure, price momentum in stock picking gets you better returns, but the downside volatility can rip your face off. Just ask recent holders of biotech stocks. I call that approach Momentum 1.0. Here is Momentum 2.0. Researchers at Cass Business School found a better way of approaching price momentum (paper here). Stock level price momentum works much better when the market is going up. Avoid betting on price momentum when the market is falling. I found a similar effect when picking sectors and industries in my own work (link here). 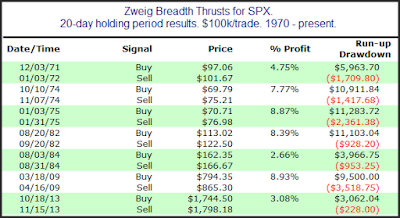 In the case ZBTs, they are powerful bull moves in a very short time, which leaves the market highly overbought. With such an overbought market, should you continue to bet on positive breadth and price momentum? That`s the next lesson: Really understand what you are betting on. Quants fall into the trap of "torturing the data until it talks" all the time in their research. If X doesn't give you the results that you want, tweaked the parameters slightly one way, or second or third way until you do. Such an approach can lead to a convoluted set of rules like the Hindenburg Omen (see The hidden message of the Hindenburg Omen). While researchers can take steps to minimize the backtesting problem of data torture, users of the research don't have that luxury. However, research users can try to understand what a model is really telling them by perturbing the rules to see how the results vary. In the case of the ZBT, we are further hampered by the low number of observations. There are very few instances of ZBTs, so it is equally important to dive into the data to really understand what it is telling us. In that regard, several points come to mind in the differing viewpoints on ZBT return results. Tom McClellan's analysis, he cited four signals since 2008. Differences in data feeds: I have noticed that Stockcharts.com TRIN readings can differ slightly from NYSE published TRIN. This may be caused by a difference in data feeds, e.g. NYSE vs. consolidated tape. Differences in calculation techniques: One of the sources of possible model readings could come from the way the weighting technique used in the calculation of the Exponential Moving Average, or EMA. What's even more puzzling is that Stockcharts.com has its own ZBT flag and its readings appear to be inconsistent with the observed readings derived from their own EMA calculations. Consider this chart of the most recent signal. Note how the ZBT flag (top panel) went negative as a setup signal, followed by the buy signal shortly afterwards. This can be confirmed by the EMA moving below 0.40 and rising above 0.615 in the bottom panel. Now look at the 2011 "signal", or non-signal: There was no negative setup signal in the ZBT flag in the top panel, but it did flash a buy signal afterwards. However, the bottom panel indicates that EMA did not actually exceed 0.615, though it got close. It`s the same story with the 2013 "signal", or non-signal. The ZBT flag (top panel) did not flash a negative value to signal a setup, though it did show a buy signal shortly after. The EMA (bottom panel) did not reach 0.615 when the ZBT flag showed the buy signal. Even McClellan's observation of the single bad return in the post-War period isn't that bad. Bottom line: ZBT = Buy the market. The reason you are not seeing signals in 2011 and 2013, is because you are using $NYAD:$NYTOT ratio, while Martin Zweig used $NYAD:($NYAD+$NYDEC). In other words, unchanged issues should not be taken into account. Stockcharts' !BINYBT is the equivalent of $NYAD:($NYAD+$NYDEC), and it clearly shows valid signals in both 2011 and 2013. I have a hard time figuring out all the different symbols in StockCharts symbol catalogue. So if there is a secret link somewhere that can help me figure out the definitions and calculations ... please share. Thanks. The both of you are awesome. That last paragraph is classic, and has wide-ranging applications. Permission to quote? Last paragraph of the Manifesto? That's not mine, but you are free to quote. Thanks for replying to my question about !BINYBT. I am familiar with StockCharts' symbol catalog. I was hoping for a documentation or the formulas behind all the symbols. I think they are working on it. And to be fair, they have had an explosion of new indicators because of all the new and good people who have joined their team at StockCharts.